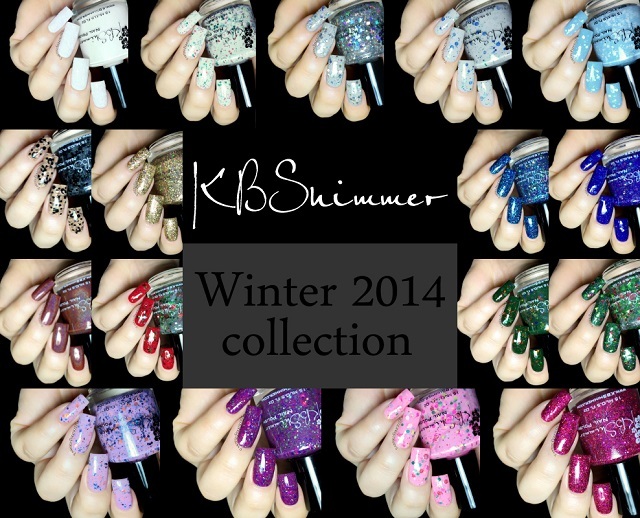 Fashion Polish: KBShimmer Winter 2014 collection swatches and review! KBShimmer Winter 2014 collection swatches and review! I have swatches of the entire KBShimmer Winter 2014 collection to share with you today. 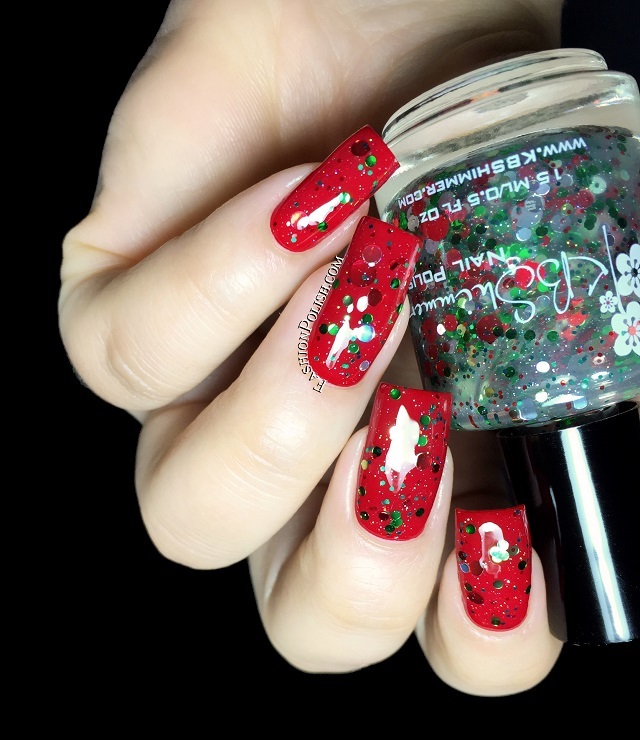 As far as Holiday themed collections go, I always feel like KBShimmer's one of those that gets me the most in the Xmas-y mood. So let's give them a closer look! All Decked Out is a limited re-edition from one of 2012 top sellers. 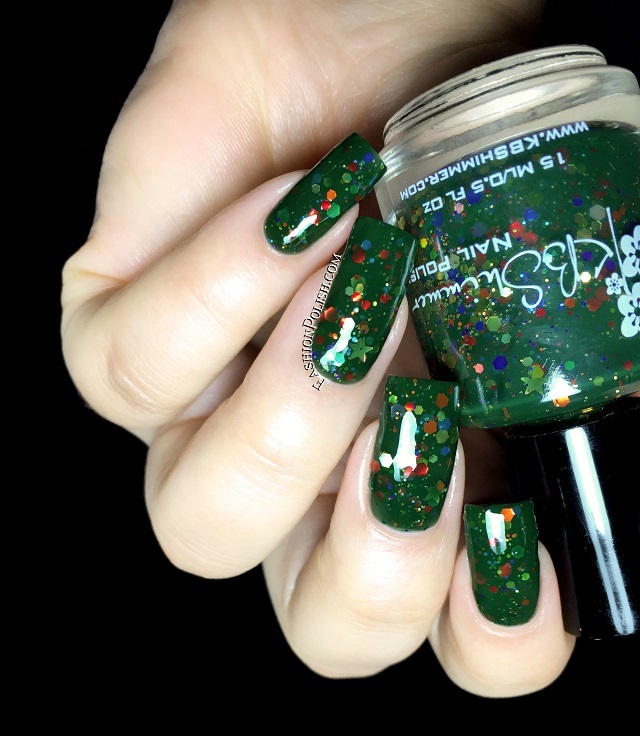 A deep forest green jelly base, with a rainbow of hex glitters and a touch of gold stars, perfect for the Season. I used 2 nice and easy coats in my swatch below. Deja Brew is a rich brown linear holo with red/cinnamon undertones. 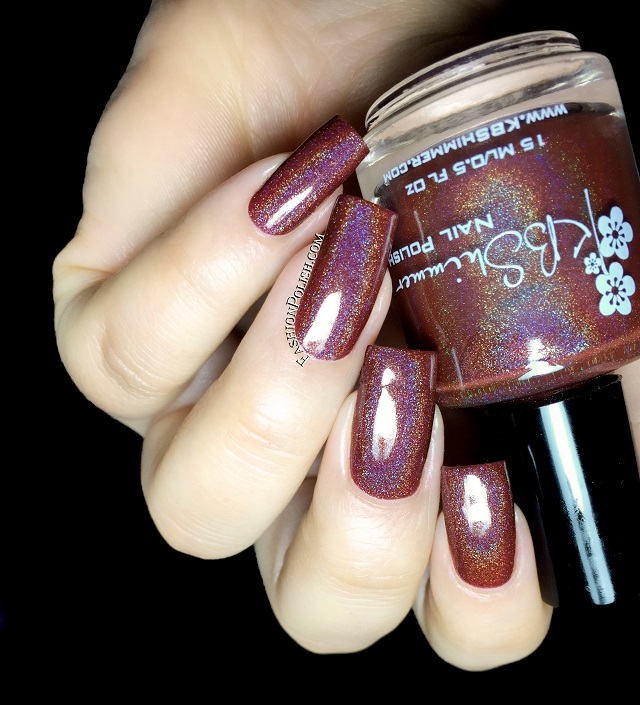 There's been several great brown holos lately and this one's definitely one of them. Great application and a 2 to 3 coats coverage, I personally use 2 coats and no topocat here. Dressed To Gild is a super bling gold textured glitter packed with holographic pieces as well as hints of lavender and lime holo. Surprisingly opaque, I used 2 coats for complete coverage. 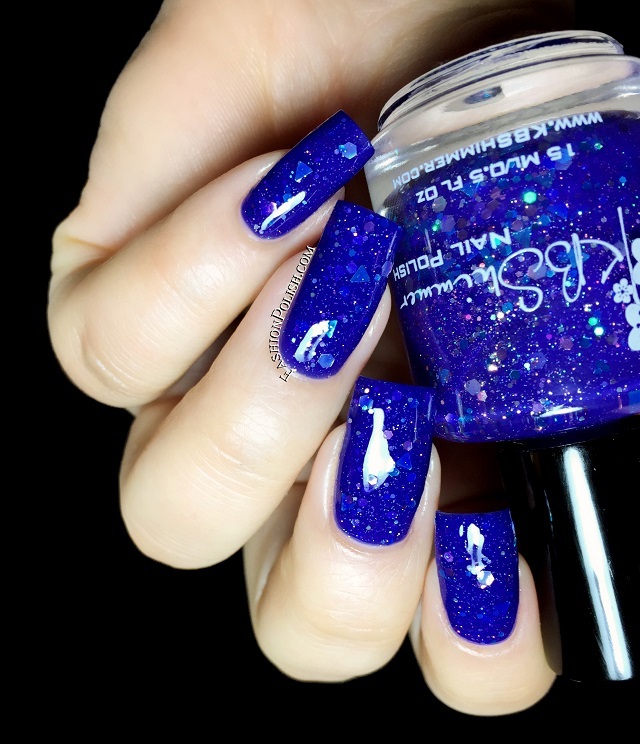 Fallen Angle is a vibrant royal blue jelly with holographic blue triangle shaped glitters and a mix of silver holo + blue hexes and micro sparkles. I love KBShimmer glitter jellies and this one's a new favorite! Two nice and easy coats were used. Flake Dance is a glitter topper made of siliver holographic snowflakes and smaller silver holographic hexes. I used one good dabbed coat over a pale gray. Holly Back Girl is a white crelly base sprinkled with red and green glitters. Formula was easy to work with although more sheer than the rest so I went with 3 thin coats. Kringle All The Way is a mix of different sizes of red, green and silver circle glitters in a clear base. I was already sold on the circle glitters but it did not disappoint! It's actually another favorite. I used 1 generous coat over a red creme. Let’s Sleigh Together is a pale gray crelly with green, navy and pale mint hexes, blueberry circles and micro holographic glitters. I used 2 coats but it seemed like a 2 to 3 coater to me. Mauve On Over is a pale mauve crelly packed with orange, navy and aqua hew glitters. Nice and easy to apply, I used 2 coats plus topcoat. Pine-ing For Yule is a 2014 Toys For Tots ® charity polish. A Christmas tree in a bottle! Holographic evergreen triangle “trees” mixed with red mini star “tree toppers as well as red and sliver glitters and holo micro glitters. I used 1 good coat over Zoya Veruschka. Snow Way! is a pale sky blue crelly with different sizes of white glitters and added micro sparkles, inspired by snow falling on a Winter's day. Great formula and application, 2 coats coverage. Spot Sign is a wild mix of black leopard spot shaped glitters as well as black dots, small black hexes and micro holographic sparkle. Instant leopard nail art without the hassle. I used 1 generous dabbed coat over a neutral/taupe dry marble. 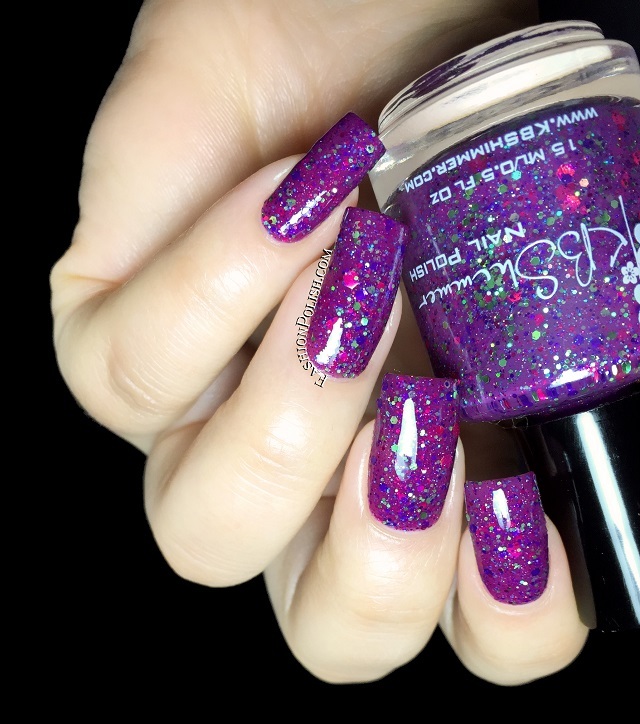 Sugar Plum Faerie is a soft plum violet crelly with different sizes of berry holo glitters, a touch of purple glitters along with small lime holographic pieces. Excellent glitter pay-off and great formula, I used 2 coats plus topcoat. 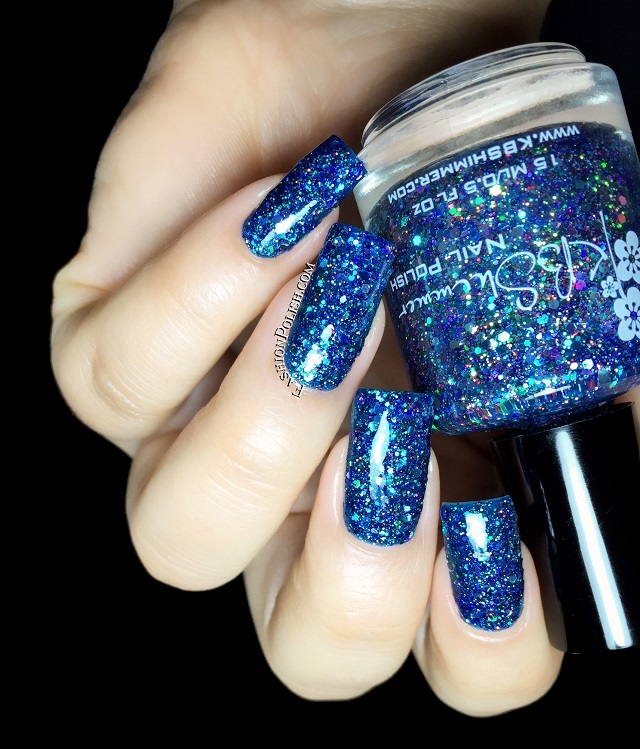 Too Cold To Hold is a sapphire blue textured glitter that consists of holographic silver, blue, and green glitters in a blue jelly base. I used 2 easy coats and 2 coats of topcoat in my swatch below. Turnip The Beet is a saturated rich magenta textured glitter, holographic glitters in magenta, purple and red in a sangria tinted base. Literally packed with glitters but easy to work with. I used 2 coats plus 2 coats of topcoat to smooth of the texture. White Here, White Now is snowy white textured glitter that dries to a matte finish. It was easier to work with than I had anticipated, I don't know why I was so scared it would be a pita. Shown below ; 2 coats and no topcoat. Another great Winter collection with many different colors and finishes to choose from. 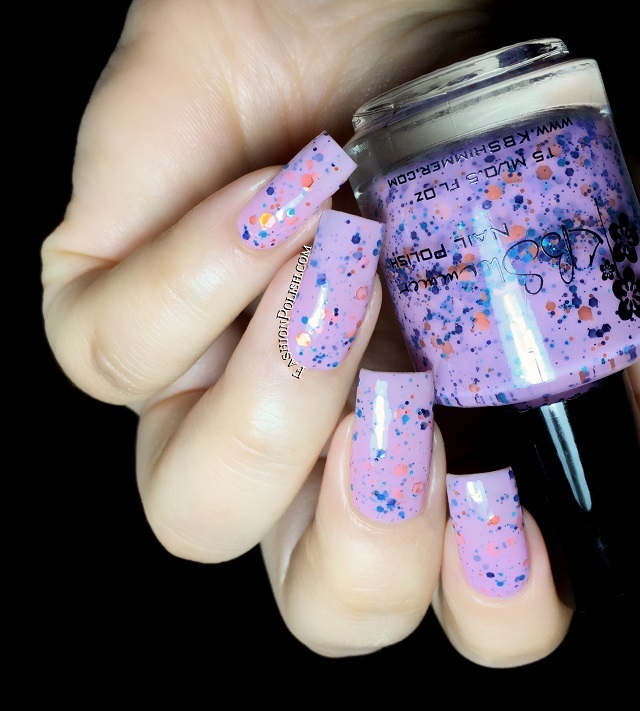 KBShimmer continues to offer excellent formulation, fun color combinations and probably some of the most clever names in the indie world, while remaining highly affordable! KBShimmer can be purchased on KBShimmer.com (US) and Harlow&Co (international) and retails for $8.75 each.